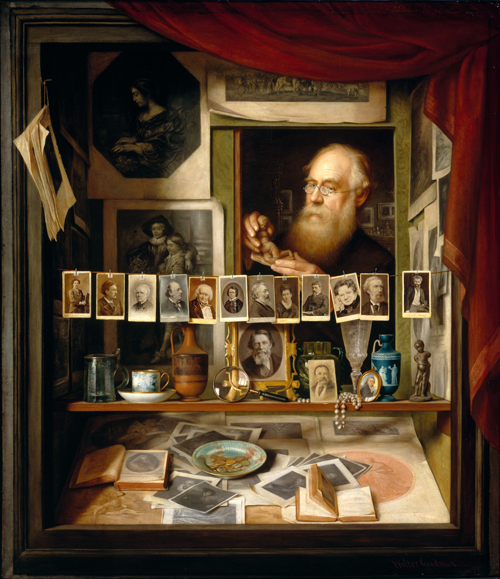 Painted in the illusionistic technique of trompe l'oeil (French for "fool the eye)," The Printseller depicts a heavily-bearded shopkeeper cradling a small statuette of Cupid. The display case before him contains a variety of objects, including prints, books, coins in a porcelain dish, a magnifying glass, a wineglass, a strand of pearls and a metal tankard. Many of the prints are reproductions of famous paintings that would have been familiar to Walter Goodman's audience of the early 1880s. A string of small photographs called cartes-de-visites stretches across the display case. These small photographic portraits, sized to mount on a visiting card, became extremely popular; a craze developed for collecting the cartes of celebrities as well as family and friends. Here, each represents a famous Victorian painter of Goodman's time, including John Everett Millais, Rosa Bonheur, and Lawrence Alma-Tadema (fourth, sixth, and ninth from the left, respectively). A larger photographic portrait of the famous art critic John Ruskin is located in the center directly below the string of cartes. Although relatively unknown, Walter Goodman was an interesting and practiced artist with a varied career as a portraitist, illustrator and writer. Of Jewish heritage, he was the son of portraitist Julia Salaman Goodman. He was widely traveled and an intimate member of London's theatrical society. He exhibited at the Royal Academy and the British Institution.